UN officials who have visited Sudan's western Darfur region say conditions there are as bad as reports suggested. James Morris of the UN's World Food Programme said it was "one of the world's worst humanitarian crises". He confirmed earlier reports that more than a million people had been forced violently from their homes. He said Khartoum needed to regain control of nomadic Arab janjaweed militias, who are accused of driving out the African population. Mr Morris, the WFP's executive director, led a fact-finding mission to the three states of Darfur from 28 to 30 April to gather information on the humanitarian situation in the region. He told the BBC World Service's Newshour programme that some humanitarian aid was getting through, but he called on the international community to provide more. Mr Morris said food was available for only about half of the displaced people. He said that without further assistance the people would "be put severely at risk" as the rainy season approaches. "Everything has been taken away from these people. This is tragic," he said, adding that he had never before seen such frightened people. Mr Morris added that security was the key issue and for this the Sudanese government was responsible. He said it was up to the government to bring the Arab militias - known as the janjaweed - under control. The UN has accused Sudan of backing the militias in a campaign of "ethnic cleansing" against black residents. 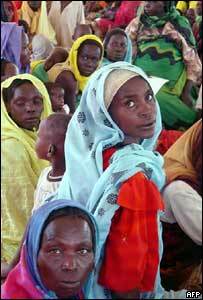 Two rebel groups in Darfur - the Sudanese Liberation Movement (SLM) and the Justice and Equality Movement (Jem) - took up arms last year, accusing the government of ignoring the region. A ceasefire was signed between the government and the rebels on 8 April to allow humanitarian aid to reach those affected. But the rebels have accused the government of consistently breaking the truce by bombing villages and backing the militia in the area. Khartoum has denied carrying out military operations against the rebels during the ceasefire but has said rebels have attacked government troops.